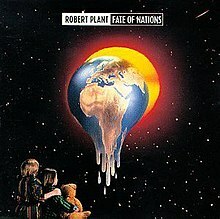 Fate of Nations is Led Zeppelin singer Robert Plant's sixth solo album. It was released in 1993 and re-released in a remastered edition on 20 March 2007. It features former Cutting Crew guitarist Kevin Scott MacMichael. The lead singer of Clannad, Máire Brennan is featured on the track "Come Into My Life". The song "I Believe" is a tribute to Robert Plant's late son, Karac. The album was Re released on vinyl as part of record store day 2019 with profits donated to charity. The album was Plant's last completely solo album until his comeback with his seventh studio album Dreamland in 2002. The album was mixed at Westside Studios by Tim Palmer. Robert Plant – lead vocals; guitar on "Promised Land"; backing vocals on "Great Spirit"
Kevin Scott MacMichael – guitar on all songs; backing vocals on "I Believe"
Oliver J. Woods – guitar on "Down to the Sea", "Memory Song (Hello Hello)"
Richard Thompson – guitar on "Come Into My Life"
Francis Dunnery – guitar on "Come into My Life", "Promised Land"
Doug Boyle – guitar on "29 Palms", "Network News"
Charlie Jones – bass on all songs; all instruments except guitar and drums on "Down to the Sea"
Phil Johnstone – harmonium on "Come Into My Life"; piano on "I Believe", "29 Palms", "Memory Song (Hello Hello)", "If I Were a Carpenter"; organ on "Promised Land"; electric piano on "The Greatest Gift", "Great Spirit"; backing vocals on "Great Spirit"; electric orchestra on "Network News"
Phillip Andrews – keyboards on "Memory Song (Hello Hello)"
Pete Thompson – drums on "Calling to You", "Come Into My Life", "The Greatest Gift", "Great Spirit"
Chris Hughes – drums on "Down to the Sea", "Come Into My Life", "I Believe", "29 Palms", "If I Were a Carpenter", "Promised Land", "The Greatest Gift", "Network News"
Michael Lee – drums on "Memory Song (Hello Hello)", "Network News"
Chris Blackwell – drums on "Promised Land"
Nigel Kennedy – violin on "Calling to You"
Nigel Eaton – hurdy-gurdy on "Come Into My Life", "I Believe"
Maartin Allcock – mandolin on "If I Were a Carpenter"; all instruments except drums and vocals on "Colours of a Shade"
Lynton Naiff – String arrangement on "If I Were a Carpenter", "The Greatest Gift"
Navazish Ali Khan – violin on "Network News"
Gurdev Singh – dilruba & sarod on "Network News"
Surge Singh – sarangi on "Network News"
Máire Brennan – backing vocals on "Come Into My Life"
Julian Taylor – backing vocals on "I Believe"
Steve French – backing vocals on "I Believe"
John Flynn – backing vocals on "The Greatest Gift"
^ Led-Zeppelin.org. "Led Zeppelin Assorted Info". Archived from the original on 14 May 2012.